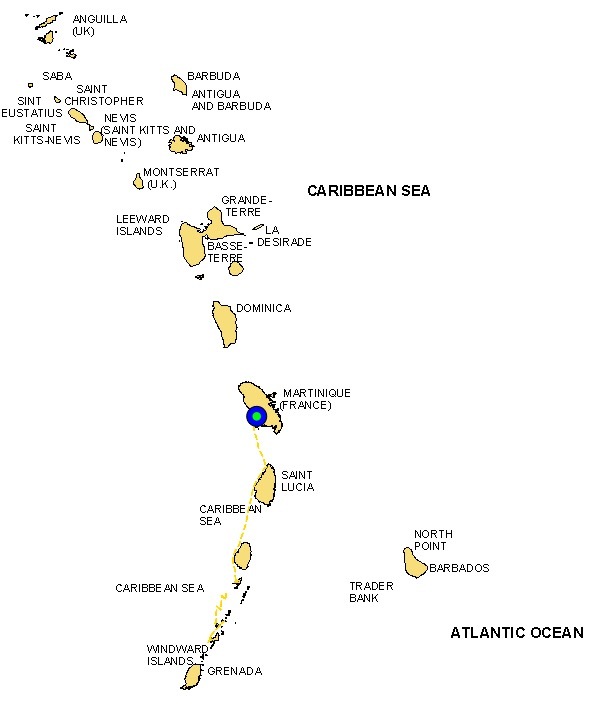 Although my last post referred to the island of St Vincent, we didn’t actually stop there on our way north from Bequia to Martinique; the weather window was open for two days before forecast rough seas expected to roll in from the Atlantic. St Vincent is a magnificent looking island – as most are in the Caribbean – rugged, volcanic, covered in thick jungle. We visited St Lucia earlier this year and we would stay only one night at Rodney Bay for a sleep before heading to Fort-de-France on Martinique’s west coast early next morning. 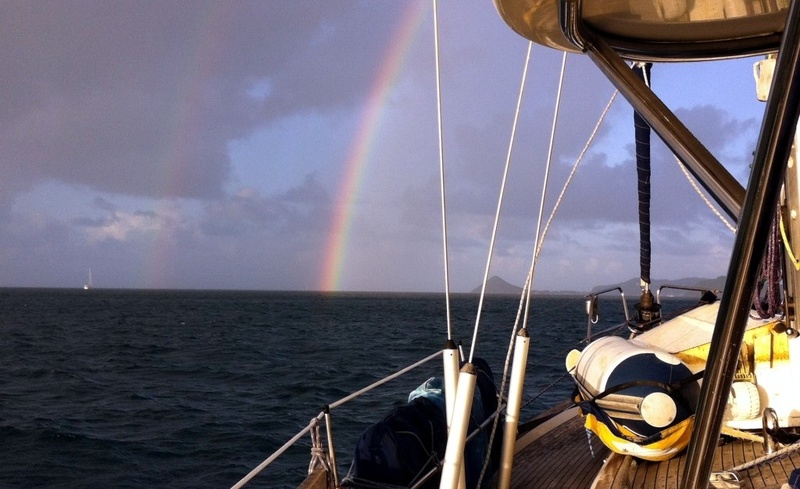 The next day our course was NNW which gave us a break from bashing into seas, so with trimmed sails and 25kn easterly, we had a fast sail to Martinique. By late morning after a fantastic sail from St Lucia, we’d pulled in at Petit Anse D’Arlets and grabbed one of the free moorings. Petit Anse is familiar to us, so we went directly to Cyber Base to use their computer to check in for the reasonable cost of 3 Euros. Within an hour we had checked in, had a swim, bought goodies from the boulangerie, eaten a baguette for lunch plus a delicious chocolate gateau for a treat! Gotta love the French islands! We motored along the lee of Martinique for around seven miles north into the harbour of Fort de France. Deep within the harbour, Trois Ilets was supposed to be a nice anchorage but I wasn’t happy with the area. It was too exposed to fetch from the east and very shallow. With strong winds due over the coming days, I did not want to be dragging through weed. 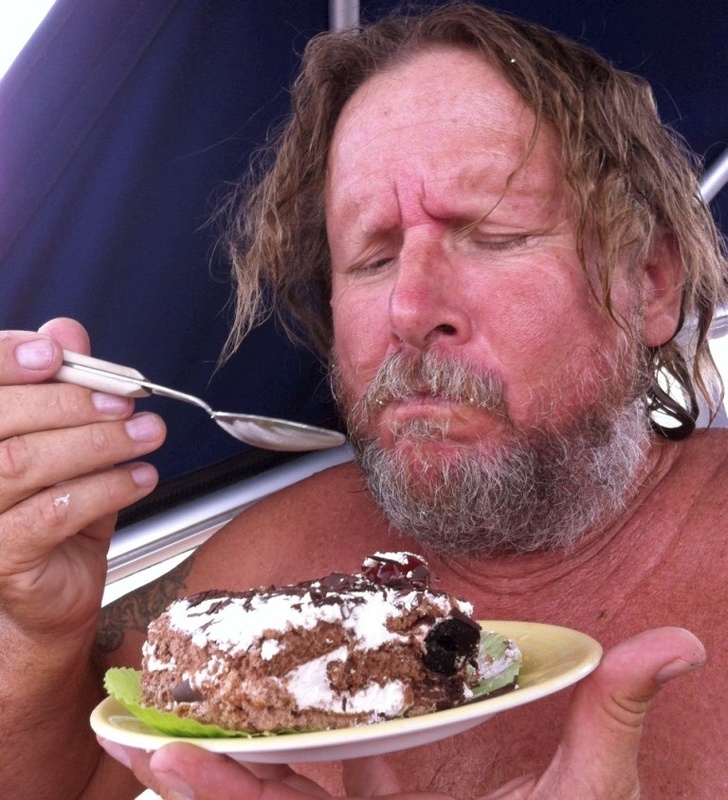 There were no other transient yachts here either except for few old yachts weighed down with weed and barnacles. We motored back around to Pointe du Bout on the southern bank of the harbour and dropped anchor tucked behind Anse Mitan near one of the the ferry terminals. 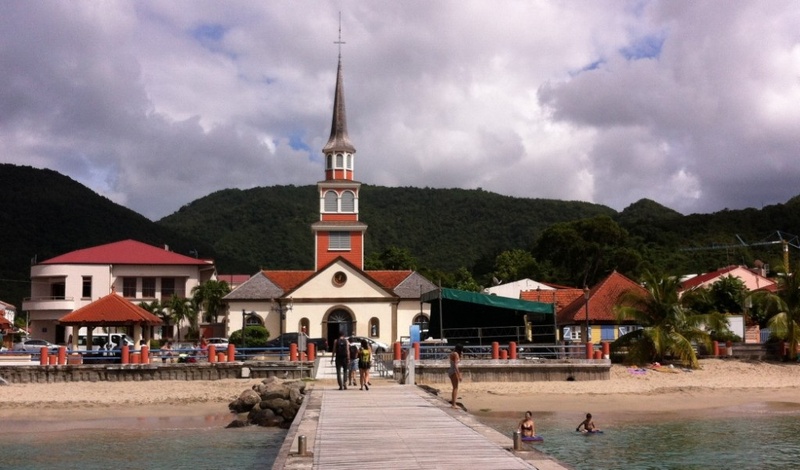 From Anse Mitan or Point du Bout it’s a short ferry ride across to the very French town of Fort de France. It wasn’t long before I’d stocked up on more French goodies that I’d missed in the other islands – pâté, fromage, yaourt, cafè, crème fraîche, and a bottle of Merlot for Wayne. Our latitude is 14deg33’N and the climate is perfect. Evenings are cool enough to have a light blanket, while the days are around 25-30degrees. So with Christmas upon us once again, I look back at the year that was. Famous people who dared to be different left us this year – David Bowie (the Androgynous one), Prince (the Symbol), Fidel Castro (the Revolutionary), Mohammed Ali (The Greatest), Gene Wilder (The Waco Kid!) – just to name a few. This year evil terror attacks saddened and angered us, while the paradoxical actions of voters – disgruntled, disillusioned, disenfranchised, even those deplorables! – certainly astonished many of us, as we are taken on an uncharted journey into Bizarro World! But as the year drifts to a close, my thoughts are with my family on the other side of the world in Australia. Regular readers will know that my brother’s sons, my nephews Matthew and Tim, have Niemann Pick Type C disease. Tim, at 27 who stands over six feet tall, is in the grips of this disease, having been hospitalised on and off since October. Although I’m not there to give him a big hug, I’m comforted to know that both he and Matthew are cared for by excellent health professionals, and surrounded by good friends and family that love them very much. For those that follow this blog or the Blue Heeler Facebook page and have helped raise awareness and supported the Australian NPCD Foundation with their fund raising efforts this year, thank you very much for your kindness. If you can support ongoing research to fight NPCD and help the families battling this disease, the Australian NPCD Foundation accepts donations through their website. 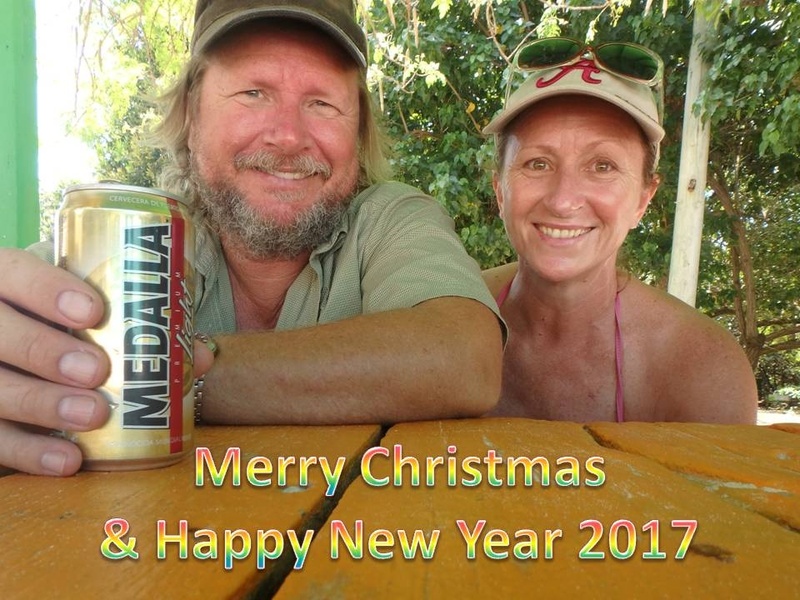 To our family, our readers and sailing friends who may also be far from loved ones, we wish you a safe and happy Christmas season and hope 2017 brings peace, health and happiness for all. Aside | This entry was posted in 2016, Martinique and tagged Anse Mitan, Bequia, Caribbean, Christmas, Martinique. Bookmark the permalink. And to you! Great to see you this year. All the best to you and your family in 2017. Merry Christmas and happy new year to you both. I stand in awe of your courage in undertaking your epic voyage. Thanks Judith and Gary. Merry Christmas to you and yours, and best wishes for the New Year.